When you’re alone with your iPod and your Mac, it’s easy to manage your library and sync your music, videos, audiobooks and data. But with the holidays over, many family members who didn’t have iPods beforehand may now find themselves the proud owners of one of Apple’s music players. And when two or more people share a Mac, it gets a bit confusing. There are several ways you can sync multiple iPods to one Mac, but the easiest method is to share a music folder. Here’s how you can share your music with another user on your Mac. Generally, each user has his or her own OS X user account, and iTunes is designed to store music in a user’s Music folder. If Alice and Paul both like jazz, but only Alice likes classical music and only Paul likes bluegrass, they may not want to have to use up disk space by duplicating the music the both like. In addition, when they buy new music that they both like, they need to be able to add it to their libraries so they can both put it on their respective iPods. OS X user accounts employ permissions to prevent one user from rooting around in someone else’s folders, but there’s a special Shared folder that useful for anything that multiple users want to access. Let’s say that Alice has already started setting up her library. She has music in the iTunes Music folder in her Music folder, which is, in turn, in her user folder. If Alice navigates to the top level of the hard drive, she can double-click on the Users folder to find the Shared folder. Alice then drags her iTunes Music folder to the Shared folder, and goes to iTunes’ preferences. In the Advanced pane, she clicks on the Change button next to iTunes Music Folder Location. She navigates to the Shared folder, and selects her iTunes Music folder, then clicks on OK. iTunes will now look in that folder for her music, and put any new music or media files there as well. Alice then highlights the iTunes Music folder in the Finder, and presses Command-I. At the bottom of the dialog that displays, she clicks on the disclosure triangle next to Sharing & Permissions, then clicks on the lock icon and enters her password when requested. Next to Everyone, she selects Read & Write under Privilege. Then, from the Action menu (the one with the gear), she chooses Apply To Enclosed Items. This tells OS X to allow all users to have access to all the files in that folder. You can tell iTunes where to look for your newly moved music folder within its Advanced preferences. Now when Paul logs into his account, he goes to iTunes’ preferences and makes the same change to the iTunes Music folder location as Alice did. 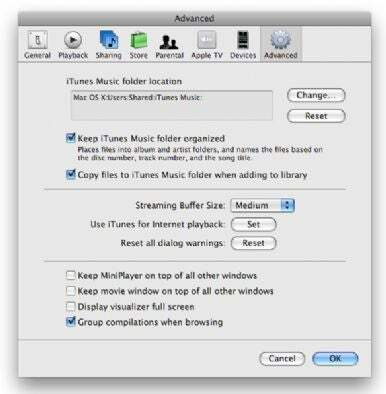 (Note that both users should place checks next to Keep iTunes Music Folder Organized and Copy Files To iTunes Music Folder When Adding to Library. This ensures that whenever either Paul or Alice adds new files, they go in the correct folder.) Paul then drags the iTunes Music folder from the Shared folder onto his iTunes window to add Alice’s files to his library. Now that this is set up, Alice and Paul will each see the same music. Each user can make his or her own playlists, and sync his or her iPod. If Paul doesn’t want to sync Alice’s classical music, he can just select it all and delete it (making sure to tell iTunes to keep the music files, so Alice can still use them). It gets a little tricky when Alice or Paul add new content to their libraries, either by ripping CDs, purchasing music from the iTunes Store, or adding other media files. When Alice rips a new CD, the music files are added to her library, and to the shared iTunes Music folder. But Paul’s copy of iTunes doesn’t scour that folder looking for new files; it only knows what has been added to each library. This means that when he logs in to his account and launches iTunes, he won’t see the new music in his library. He’ll have to go to the iTunes Music folder in the Shared folder, find the folder with the new CD, and drag it onto the iTunes window. (He can also choose File: Add To Library and select the folder from the Open dialog.) It will get added to his library, so he can sync it to his iPod as well. The same is true for other files, such as videos or audiobooks.